The first thing that I noticed was that this thing is huge. It is almost as long as my Stellarvue 10x60mm Finderscope and a healthy slug wider diameter. Indeed – this monster fits into my NP101is with no special adapters needed as it’s built on the NPis 2.4 inch diameter specification. Since I use an APS sized sensor most of the time (on my Orion StarShoot Pro), I generally don’t need the extra big of space, but nonetheless it certainly does the job. It’s just a lot larger than you’d expect from a typical barlow or powermate type of accessory. While I probably should have continued on with M2, the real comparison here is for field of view. I also gave the Orion SkyGlow a moment for extra comparison, although it was pretty dark and these were short exposures. 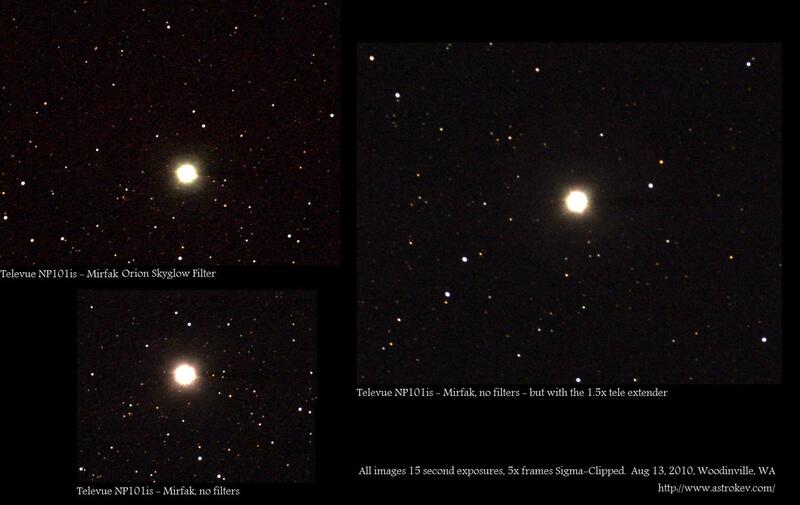 In this case, each image here is of Mirfak, a bright star in Perseus. Of course, I was looking that way for the Perseids meteor shower, so this turned out to be a fun target in hopes of catching some extra meteors. 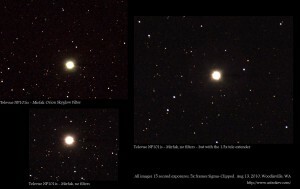 In this case, each image in the composite is 5x 15s exposures; nothing fancy here. While the fields are rotated (I didn’t put the camera back on the same), and the 1.5x is rotated more still, the interesting thing to observe here is the image scale. You can also see that the SkyGlow didn’t do much for me – but this wasn’t a long enough exposure with lots of light pollution to test with. 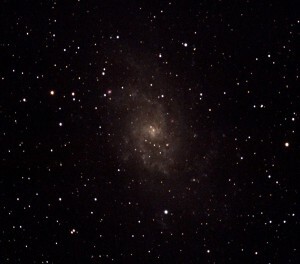 A slightly more interesting comparison is M33. 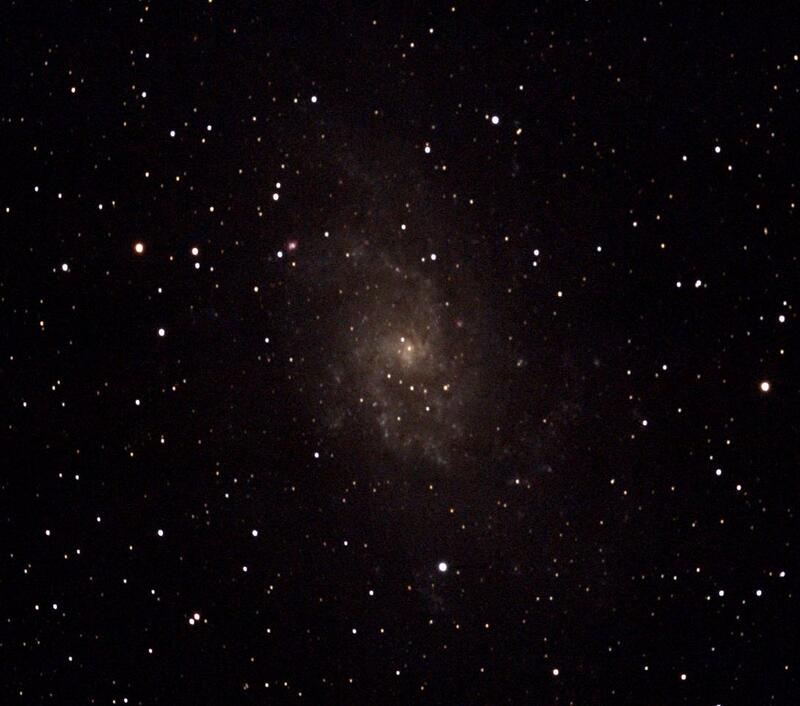 I previously imaged M33 at F/10 on the CPC1100 and f/5.4 on the TV NP101is. This provides a pretty nice contrast to the field of view – with 20x 60s exposures. This entry was posted by admin on August 16, 2010 at 8:06 pm, and is filed under Equipment. Follow any responses to this post through RSS 2.0.You can skip to the end and leave a response. Pinging is currently not allowed.